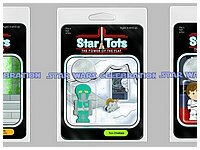 The Collecting Track has announced the next 6 Star Tots that will be given away during their panels in room W474 at Star Wars Celebration! 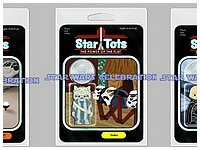 Click on the thumbnails above for a closer look at Han in Stormtrooper disguise, 2-1B, Chewbacca in Ceremonial outfit, Luke in Tatooine Poncho, Teebo and Vader Unmasked! Check back for more reveals over the next week! Check out this amazing and very limited Lucasfilm approved 8-piece patch set available exclusively at Star Wars Celebration Chicago! SWC19: Collecting Track Schedule Announced! 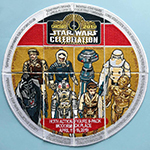 Along with all of the other panels, the schedule of events for the Collecting Track has been released on the official Star Wars Celebration site. Follow the link and click on the Collector Stage under Location on the left-hand-side to discover what treats are in store for collectors! 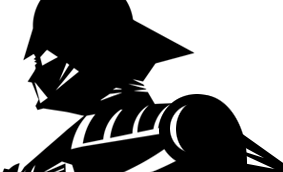 The Star Wars Collectors’ Stage, located in Room W474, will feature panels by expert collectors around the world during all 5 days of Star Wars Celebration. 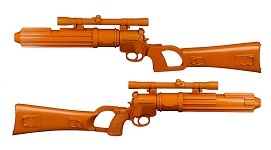 A new blaster kit is now available for pre-order from ANOVOS in the form of Boba Fett's EE-3 Blaster Kit from Return of the Jedi. 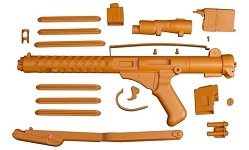 Priced at $225 and with a delivery estimate of Q1 2020, this 1:1 prop replica costume accessory ships in seven parts as a build-it-yourself kit, and requires clean-up and physical assembly. Click on the previous link for more details. We are pleased to reveal our Star Wars Celebration Chicago badge celebrating the 20th Anniversary of The Phantom Menace being produced exclusively for our Forum Members! If you're planning to attend and have had an account prior to 10:00pm (Eastern) on Saturday, March 9th, your eligible to request one for the show. Head to our Celebration Chicago forum right here to sign up now! No Stormtrooper is complete without a trusty E-11 Blaster by their side, and you can now pre-order a 21-piece kit from ANOVOS to build one yourself! Follow the previous link for all the details and to place your pre-order.